At the offices of Scott Young, DDS you are not just another patient; you are treated as a prominent guest from the moment you walk in. Dr. Young’s practice is based on a foundation of providing personal attention to every guest. Personalized treatment plans ensure your comfort at every level of service including sedation dentistry, a serenity suite for relaxation, pillows, blankets and noise cancellation headphones. 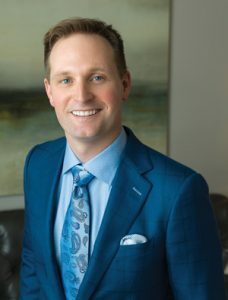 A graduate of the University of Texas Dental Branch, Dr. Young focuses on cosmetic and implant dentistry while offering the full spectrum of dental services including teeth whitening, implant supported prosthesis and full smile makeovers. Dr. Young has completed all core courses at LVI for Advanced Dental Studies. In addition, Dr. Young holds fellowship status with the American Dental Implant Association and was named a Super Dentist® in Texas Monthly. “With the most advanced dental technology, a warm and knowledgeable team, and all the amenities necessary to help you feel relaxed and comfortable, our office is the place to receive five-star cosmetic dentistry treatment along with the smile you’ve always wanted,” says Dr. Young.